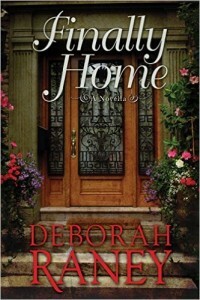 Finally Home by Deborah Raney is a Christian novella set in America 1972 during the Vietnam war. Brian returns from Nam in a wheelchair. His parents alter their huge house to accommodate his needs, hire a physical therapist and then disappear to Columbia. “If money could buy a miracle, he was home free.” Brian’s parents have everything money can buy. However money cannot buy health or good relationships. Kathy is Brian’s therapist and she believes in him. She works with him and encourages him. She is balm to his wounded body and soul. But Kathy is hiding a secret. Kathy and Brian both fight for peace. Literally in Brian’s case. And Kathy goes on peace marches against the war in Nam. “People in this nation were dying of apathy as fast as the innocents in Vietnam.” Their aims are the same but their approaches very different. Deborah Raney demonstrates the futility of war. The lives it wrecks, not just physically but mentally. She touches on the theme of PTSD. She shows how war is complicated, even children can be brain washed. Brian in spite of his situation still has a strong faith in God. “He drew his strength from his trust in God.” This is what will see him through whatever life throws at him. Whatever we are facing, fixing our eyes on God and trusting Him will help us in all situations as we feel His peace. I love all Deborah Raney’s writings and this novella is a delightful read. So, grab yourself a download and a cup of coffee and settle down on the sofa to transport yourself back to America 1972.